Cranial Osteopathy is a refined and subtle type of osteopathic treatment that uses very gentle manipulative pressure to encourage the release of stresses throughout the body, including the head. It is not as the name might suggest a form of scalp massage, but instead a series of supportive contacts that in many instances undermines the patient's tension. As tension and pain are so closely allied this can effectively alter their perception of pain, and provide significant steps towards recovery. As treatment is very gentle, patients may not feel much, or may be aware of slight movement or heat; you may also feel tired after treatment. It is a safe and effective means of managing conditions whereby a more vigorous approach would be unsuitable. 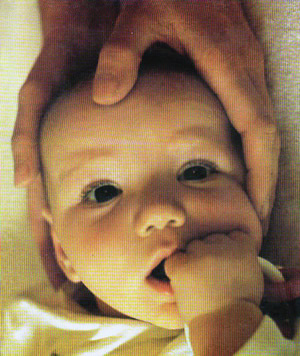 For example, pregnant women, babies with colic or children with glue ear. It can be equally beneficial to adults in the cases of headaches, jaw pain, sinus problems, plus much more. Please go to the homepage or look under the 'what we treat' section of the main menu for more conditions in pregnancy and babies/children that cranial osteopathy can help to manage.